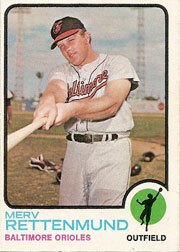 By his own account, Merv Rettenmund was a “scuffler” more than a ballplayer. He never found his niche as a regular starter with the Baltimore Orioles, but he starred as a super-sub and was a key cog for the Orioles as they won three consecutive American League pennants, from 1969 to 1971. He twice led the team in batting average in those years while playing all three outfield positions. More than that, Rettenmund always seemed to find himself as part of a winner — as a player and coach, his teams reached the postseason in 13 of his 33 seasons in major-league baseball. He played in four World Series, winning championships in 1970 with the Orioles and in 1975 with the Cincinnati Reds. Later, he became one of the game’s top pinch-hitters with the San Diego Padres and California Angels. After he retired, Rettenmund became one of the most respected hitting coaches in baseball, and he was on staff for three more World Series — with the Oakland Athletics in 1989 and 1990 and the San Diego Padres in 1998. He once called his job as a hitting coach “50 percent comedian, 25 percent psychologist, and 25 percent teacher,” but his methods worked.1 Led by Hall of Famer Tony Gwynn, who won half of his eight batting titles under the tutelage of Rettenmund, the Padres set franchise records in nearly every offensive category in the 1990s. In a rare move for a coach, Rettenmund remained with the team through three managerial changes. Baseball was always Merv’s ambition. “I’d go to games at Tiger Stadium all the time, see those guys in their uniforms and watch them play,” he recalled. “I thought, ‘Gosh, I’d love to do that.’ ” 5 In addition to baseball, the speedy teenager also starred as a halfback in football at Southwestern High School in Flint. During the Princeton tournament, Rettenmund was approached by Ray Louthen, the baseball and football coach at Ball State University in Muncie, Indiana. As Merv recalled: “I had been considering Western Michigan or Michigan State — I was looking at them, but I don’t know if they were looking at me, you know? … Ray Louthen came up to me [at Princeton] and said, ‘If you’ll come play for us, I’ll give a scholarship to your cousin and to your friend.’ ” It was a football scholarship, Rettenmund said, “so they could bring more players in.”7 Merv took it. At Ball State, Rettenmund broke the school’s single-season rushing record held by Timmy Brown, who played for the Philadelphia Eagles and Baltimore Colts. Rettenmund was good enough to get drafted by the Dallas Cowboys — much to his surprise, because he had played just three games as a senior because of injuries. In baseball, he was a two-time All-Indiana Collegiate Conference first-team selection, hitting .321 in his career. He later became a charter member of the Ball State Athletics Hall of Fame.8 In 1966, two years into his professional career, he earned his bachelor’s degree in education. As a result, Rettenmund made the 1968 Orioles roster out of spring training. His major-league debut came on April 14, when he struck out as a pinch-hitter against the Angels’ Clyde Wright to end the game. He made three more appearances that week, getting two hits and walking once, before being sent down to Triple-A Rochester when pitcher Pete Richert was activated from National Guard duty. In Rochester, the sweet-swinging right-hander flourished, hitting .331 with 22 home runs to earn International League MVP and Rookie of the Year honors, as well as The Sporting News’ Minor League Player of the Year award. When outfielder Curt Motton was injured in late August, Rettenmund was called up to Baltimore for good. Three days after Rettenmund’s call-up, he was sent in to pinch-hit for Ellie Hendricks in the bottom of the ninth inning. He homered on the first pitch he saw from Oakland reliever Warren Bogle to beat the A’s, 5-3.11 Rettenmund batted .265 in the final month as manager Earl Weaver moved him up and down the lineup. He was a valuable utility man for the Orioles in their championship years, but he never settled into a regular position. There was also no room for a rookie outfielder to break into Baltimore’s lineup. Future Hall of Famer Frank Robinson, who had won the American League’s Triple Crown in 1966, held down the fort in right field, while Paul Blair was considered the game’s best defensive center fielder and Don Buford was a solid starter in left field. In the 1969 World Series against the upstart New York Mets, Rettenmund made his only appearance as a pinch-runner in a Game Two loss. The Orioles lost the Series in five games, in one of baseball’s biggest postseason upsets. Rettenmund did. During the second half of the season, he batted a blazing .373, hitting safely in 16 of 17 games between July 26 and August 15. He had three four-hit games in a five-week span, finishing the year with a team-high .322 average and 18 home runs. In the league playoff with the Twins he started Game 2 and played well — he walked twice, stole a base, and had an RBI single in the ninth inning of a tight game, and the Orioles swept the series. In the World Series, he did not get a chance to start until the fifth game, and did not learn of this until late in the Orioles Game 4 loss. Whatever the case, the 28-year-old Rettenmund continued to hit like a machine in 1971 — leading the team again with a .318 average, good for third in the American League behind Tony Oliva and Bobby Murcer — no doubt helped by the fact that he finally was receiving steady playing time in the Orioles’ lineup, even if he was never sure which position he would play until he got to the ballpark. Rettenmund started 58 games in right field, 38 in left field, and 37 in center field, but logged more innings (1,170) than any other Orioles outfielder. At the plate, he set career highs with 75 RBIs, 81 runs, 15 stolen bases, and 491 at-bats in 141 games. His performance earned him a few MVP votes at the end of the year as the Orioles swept the Oakland A’s to clinch the AL pennant. In the 1971 World Series, Rettenmund earned a spot in the Orioles’ lineup as Baltimore prepared to defend its title against the Pittsburgh Pirates. His three-run home run off Dock Ellis in the third inning of Game One proved to be just enough of a margin for Dave McNally, who shut down the Pirates on three hits, but the Orioles ultimately fell in seven games. Surprisingly, the Orioles relieved the crowded outfield by dealing Frank Robinson, their biggest star and leader, to the Los Angeles Dodgers in November. With Robinson gone, Rettenmund inherited the starting job in right field and got the chance to play regularly. But injuries plagued him from the beginning. During a four-hit day in Detroit, he dove for a ball and landed awkwardly on his right shoulder. The next day, he couldn’t lift his arm. In August, he suffered a torn abdominal muscle and was placed on the disabled list.16 In between, he suddenly, inexplicably lost the ability to hit. Rettenmund got off to a poor start in 1973, hitting .230 before the All-Star break, and after severely bruising his chest crashing into the outfield wall in Kansas City in May, he lost his job in right field. After a one-year hiatus from the postseason, the Orioles were rolling along to another division title. The club benefited from a powerful farm system that continued to produce strong outfield prospects — before, it had been Blair, Buford, and Rettenmund; now Don Baylor, Al Bumbry, and Rich Coggins were muscling in for more playing time. When Rettenmund’s slump continued in the playoffs, in which he hit .091 in a losing effort against the Oakland A’s, he too was deemed expendable. Rettenmund was given a fresh start with the Cincinnati Reds, who traded for the 30-year-old in a five-player deal that sent pitcher Ross Grimsley to Baltimore in December 1973. Merv seemed pleased to go from one winning franchise to another, but moving to the National League did not help his hitting get back on track. Rettenmund signed as a free agent with the California Angels in 1978 and was an asset off the bench, hitting the first pinch-hit grand slam in team history on May 6. In 1979, he helped the Angels to their first postseason appearance by hitting .263 in 76 at-bats. In the ALCS that year, he returned to Baltimore along with three other former Orioles — Don Baylor, Bobby Grich, and Larry Harlow — to face their old team, still piloted by Earl Weaver, whom Rettenmund has called the smartest manager he knew in baseball. “The only way to measure a manager is by how his guys produced for him, and guys played for Weav,” he recalled.21 Weaver’s players outperformed Rettenmund’s Angel teammates in the playoffs, winning Baltimore’s fourth and final pennant for the Hall of Fame manager. Rettenmund was limited to just four plate appearances in the ALCS. That offseason, Rettenmund began to consider life after playing baseball. His education degree made him well-suited for teaching, and coaching was the next best thing. For years, he had helped his teammates — many of them among the best in the game — tinker with their swings, observing what worked and what didn’t to develop his own philosophies on hitting. More than most coaches, hitting coaches work in almost total obscurity. Rettenmund often said that his work ended when the game began, having spent most of his day under the stands in the batting cages or the video room tutoring players.22 But his reputation as a hitting coach over three decades did not escape notice. In 1989, after serving three years as Oakland’s roving hitting instructor, he moved up to become Tony La Russa’s hitting coach with the A’s, who won pennants in both years Rettenmund was on the coaching staff. Rettenmund maintained that the 1989 A’s were the best team he’d ever seen, better even than the two championship teams he played on, the 1970 Orioles and the 1975 Reds. It was a match made in hitting heaven. Gwynn had battled injuries on the field and dissension off it to hit for one of the lowest averages of his career, .309, in 1990. Rettenmund, a gregarious personality who was easy to talk to and loved to discuss hitting as much as Gwynn did, helped the pudgy outfielder reach new heights for the rest of the decade. The future Hall of Famer never hit below .317 again and won four consecutive batting titles from 1994 through 1997 to tie Honus Wagner’s National League record with eight in his career. Rettenmund said the most amazing quality about Gwynn was his consistency: “We’d hit off the tee every day. I think there were years when he hit off the tee 365 times. … And he never ducked a pitcher. Some guys will take a day off against a Randy Johnson. Tony would be in there every time.” He added that he rarely discussed mechanics with Gwynn, knowing full well that the only time Gwynn stopped hitting was when his knee was hurting. Rettenmund was fired partway through the 2007 season and, after more than four decades in baseball and in his mid-60s, he said he didn’t plan to get back into full-time coaching again. In between trips around the world with his wife and spending time with his grandchildren, he offered private hitting instruction to youths in the San Diego area. He occasionally attended Padres games at nearby Petco Park — “I like to watch. But I like it more when they score some runs!” he said of his offensively challenged former team. This biography is included in "The Great Eight: The 1975 Cincinnati Reds" (University of Nebraska Press, 2014), edited by Mark Armour. It originally appeared in "Pitching, Defense, and Three-Run Homers: The 1970 Baltimore Orioles" (University of Nebraska Press, 2012), edited by Mark Armour and Malcolm Allen. 1 Brian Hiro, “Hitters warming up to Rettenmund’s advice,” North County Times, June 24, 2006. 2 United States Census, Ancestry.com and RootsWeb.com, accessed December 16, 2008. 3 Merv Rettenmund, interview with author, January 12, 2009. 4 Robert Markus, “Rettenmund So Wrong, He’s Right,” Chicago Tribune, October 10, 1971. 6 Dan Nilsen, “1961 Buick Colts Baseball Team,” The Flint Journal, http://blog.mlive.com/flintjournal/sports/2007/11/1961_buick_colts_baseball_team.html, accessed December 23, 2008. 7 Rettenmund, interview; John Ginter, “Baseball at Ball State,” Ball State University Alumni Association, http://bsu.edu/alumni/march2003/sportsfeature/, accessed December 9, 2008. 8 Ed Rumill, “Rookie Balks at No. 4 Idea,” Christian Science Monitor, March 31, 1969; Doug Brown, “Orioles Find A Place For Rookie Merv’s Mighty Bat,” The Sporting News, September 28, 1968, 11. 10 Rettenmund, interview; Shaun O'Neill, “Padres Inside Pitch,” North County Times, April 27, 1997. 11 “Bunker, Rookie Help Orioles Sweep A’s,” Chicago Tribune, August 28, 1968; “Orioles Beat A’s 5-3 in First Game,” Hartford Courant, Aug. 28, 1968. 15 Ron Fimrite, “Well, He’s That Kind of Guy,” Sports Illustrated, October 4, 1971. 16 Doug Brown, “Birds’ Slump-Ridden Merv Making Mark as Prankster,” The Sporting News, August 18, 1973. 17 Mark Heisler, “Homecoming for the Anaheim Chapter of the Oriole Alumni,” Los Angeles Times, September 28, 1979; Lynn Henning, “Rettenmund Works on Batting, Psyche;” Merv Rettenmund, interview with author, January 12, 2009. 19 Phil Collier, “Rettenmund Chants a Hymn of Thanks For Padre Trade,” The Sporting News, June 5, 1976, 11; Rettenmund, interview. 20 Rettenmund, interview; David Porter, and Joe Naiman, “The San Diego Padres Encyclopedia” (Champaign, Illinois: Sports Publishing LLC:, 2002), 49. 23 Ross Newhan, “Angels Get ‘Tough’ With Blue Jays,” Los Angeles Times, June 9, 1982. 25 Chris Jenkins, “An Eye on the Ball,” Baseball Digest, September 2002. 26 Shaun O'Neill, "Rettenmund Decides to Head South," North County Times, Nov. 9, 1999; author interview, Jan. 12, 2009.